The SANS Institute maintains a list of the "Top 10 Software Vulnerabilities." At the current time, over half of these vulnerabilities are exploitable by Buffer Overflow attacks, making this class of attack one of the most common and most dangerous weapon used by malicious attackers. This is the first book specifically aimed at detecting, exploiting, and preventing the most common and dangerous attacks. A buffer overflow is an unexpected behavior that exists in certain programming languages. 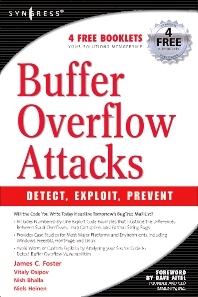 This book provides specific, real code examples on exploiting buffer overflow attacks from a hacker's perspective and defending against these attacks for the software developer. Over half of the "SANS TOP 10 Software Vulnerabilities" are related to buffer overflows. None of the current-best selling software security books focus exclusively on buffer overflows. This book provides specific, real code examples on exploiting buffer overflow attacks from a hacker's perspective and defending against these attacks for the software developer. Software Developers, Security Specialists, Network Administrators and anyone concerned with hacking and computer security.